Good low-carb ice cream isn’t easy to make. Ice cream fluffs up and stays soft because it’s an emulsification of the fat in the cream with the sugar, so if you use a different sweetener that doesn’t have the structure of sugar, it doesn’t emulsify, and you end up with a bunch of ice freezing to the sides of the container. I use 2 eggs if they’re huge, 3 otherwise. Whisk those up, then whisk in the rest. It worked out well as far as the freezing went. The gelatin helped it fluff up, and the vodka lowers the freezing temperature so it doesn’t freeze on the sides as fast. The only downside was that some of the gelatin was still a little grainy, like it hadn’t dissolved fully. 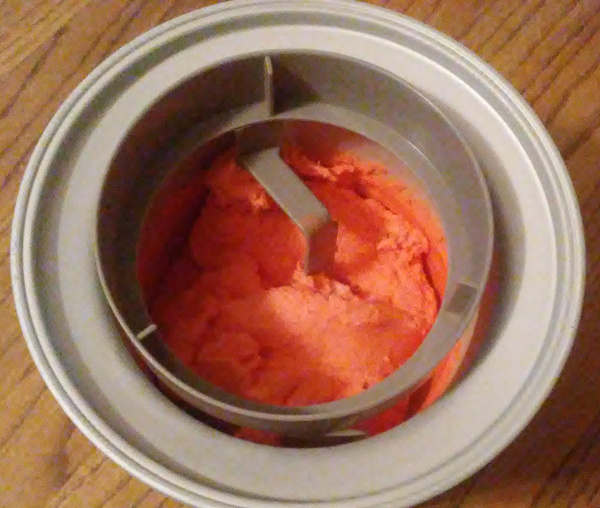 Dissolving it in hot water isn’t an option, since everything needs to go in cold for this kind of ice cream maker to work. I could let it sit in the milk for a while first, though, before stirring it all together. To be more natural and get away from the aspartame in the Jello, you could use a packet of plain gelatin, a better sweetener like stevia, and a flavoring like vanilla or chocolate. The Jello was just a convenient way to try those already mixed in the right ratio. Might have to experiment with that. Carb-wise, it’s something like 8 per serving, so it’s not bad as long as you stick to one. This is a screencast/podcast where I play Stardew Valley and talk about various things: playing the game, giving away more cats, making good-quality videos is hard, reading glasses, waking up to a cold house in winter, social media, and others. This is kind of a test of a different way to distribute things through IPFS, so it may not be that interesting in itself. But feel free to listen or watch if the links work. UPDATE: Okay, that works fine for the MP3, but not for the video. It seems using the HTML5 video tag makes your browser download the whole video (or a lot of it) before starting to play it. That’s not acceptable with a 600MB video, which people might want to bail on after the first couple minutes. Moving it to bitchute instead, and I’ll have to experiment more with that.